VLEs are in trend now with many high profile educational institutions to help them deliver learning material to students via the internet. This software system helps tutors to create courseware websites employing minimal technical skills. It can do a host of other things like tracking student progress, on and off-class communication, sharing resource material and can connect to many platforms through RSS feeds. It facilitates learning of regular students as well as those that are off-campus. Simply put, it’s the best thing that ever happened to those of us who despise classrooms and tedious lectures. There are several VLEs available and an educational institution needs to have a license for it. Some institutions even build their own bespoke VLEs to suit their needs. To ensure interoperability, these systems are SCORM and QTI compliant. Well, all I can think of is WordPress. Content Management Systems are fairly simple to understand, they simply manage content for a given platform. It allows writing, creating of pages, and administration of large amount of content (publishing and tracking) making it suitable for large organizations. It gives access to multiple users and allows reviews. It can also manage graphics and audio files. However, it is not just tracking content in elearning that’s important, the output and end delivery to the audience is the essence of it. That’s what a CMS is deficient in and hence not a much preferred tool by instructional designers. LMS is an automated system that allows delivery, tracking and management of online training material. It generates reports on user performance and results like, the percentage of course completed, time taken to complete it, or the most visited section of the course. It can manage and track such information for a substantial number of learners. You need simple math to cover this one. LCMS = CMS + LMS, and does everything these two can do combined. Fair enough? To be precise, an LCMS can author, review, approve, publish, track, and manage. It’s a multi-utility tool and a multi-user environment. 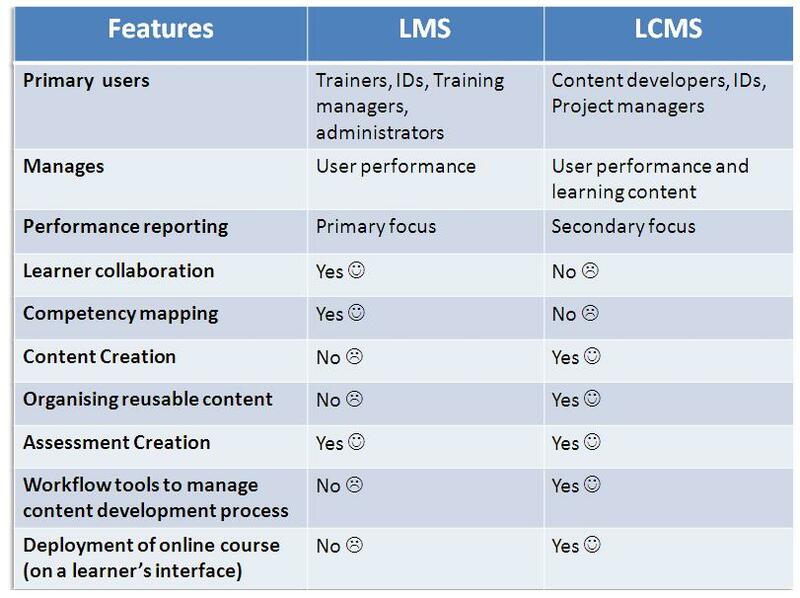 LCMSs also have the ability to store older versions of courses and companies that usually just want updates to be made in existing training material make best use of it. To sum it all up, there are a couple of products in each category available in the market and companies should use those that best suit their needs. Why work on an LCMS when all you need is a CMS? The article above only highlights fundamental differences between these management systems whereas there may be more functions and features available in the newer and more recent versions of these.